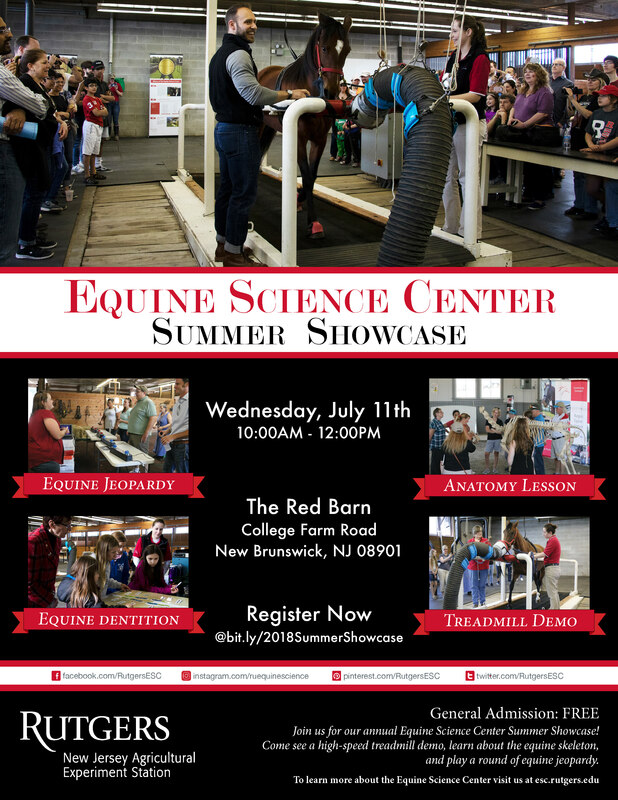 NEW BRUNSWICK, NJ – The Equine Science Center at Rutgers University is hosting its annual “Summer Showcase” from 10:00 am to 12:00 pm on Wednesday, July 11 at the Equine Exercise Physiology Laboratory on College Farm Road on the George H. Cook Campus in New Brunswick. The Summer Showcase, similar to an open house, is a FREE event that is open to the public and perfect for any and all equine enthusiasts, ages 8 and up. Dr. Karyn Malinowski, director of the Equine Science Center, will welcome guests and explain why horses are an excellent animal model to study and the type of research that is conducted at the Center. Guests will also have an opportunity to experience the thrilling demonstration of a horse galloping at full speed on the 21-foot equine treadmill. Always a crowd favorite, the demo is sure to get one’s adrenaline-pumping and heart-racing! After the treadmill demonstration, guests will learn all about equine anatomy with RU Wish Bone, the life-sized horse skeleton. The Showcase will also include a round of equine jeopardy, an interactive dentition presentation, and other exciting activities. There is no charge for the Summer Showcase; however, guests must register in advance at bit.ly/2018SummerShowcase. For additional information, contact Kyle Hartmann at kylehart@njaes.rutgers.edu or 848-932-9419.